3BL Media is the leading distributor of CSR, Sustainability and Cause news and content to stakeholders and journalists. Using traditional, social and new media channels, we ensure your message reaches the largest audience of global stakeholders. 3BL Media clients access our communications portal to upload, manage, target and distribute news and content across the social web on an unlimited basis. We maximize content’s exposure throughout the most comprehensive network of CSR thought leaders, influencers, media points, professionals and consumers. Established relationships with some of the most influential bloggers on CSR, sustainability and cause marketing. Active mainstream and CSR-focused journalists and reporters covering various topics and categories of CSR, sustainability and cause. 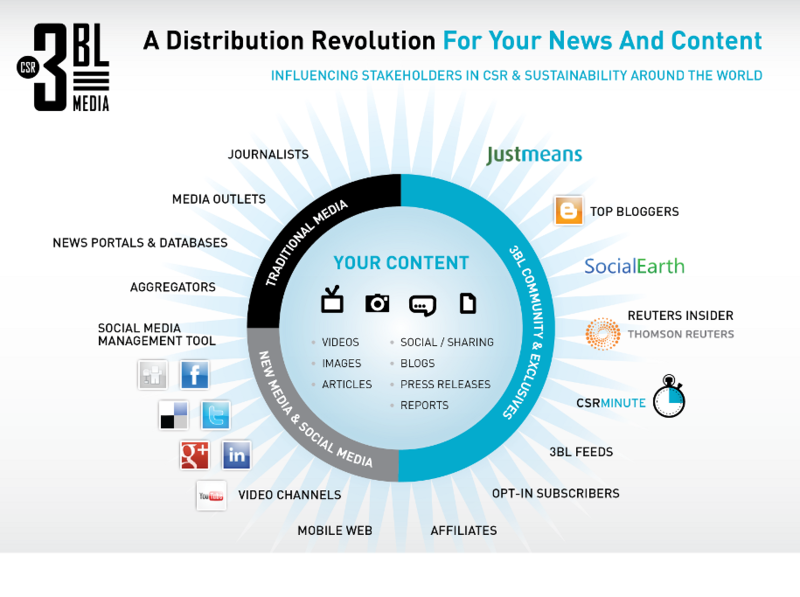 Content partner for CSR and sustainability channel on Reuters Insider, distributed to over 550,000 financial professionals worldwide. Reaching professionals, practitioners, consumers, investors and academics worldwide. A targeted and growing network of websites distributing 3BL news and content to their audiences, members and web traffic. 3BL Media’s own daily video digest highlighting trends and issues, breaking news and company profiles viewed by thousands of people every day across the internet. The CRO, World News, Lexis Nexis, Google News, Moreover, NewsBank and more. Ever expanding social networks and online communities reaching a highly targeted audience focused on specific topics and issues of CSR. 3BL's active presence on Facebook, Twitter and Linked In are powerful channels for reaching your audience through social media. Maximizes exposure of your video content through 3BL Media's channels on video sites operated across the web. Content formatted and available to most major mobile devices by email, web, sms, rss. Create custom, targeted media lists or import your own for news and content distribution.